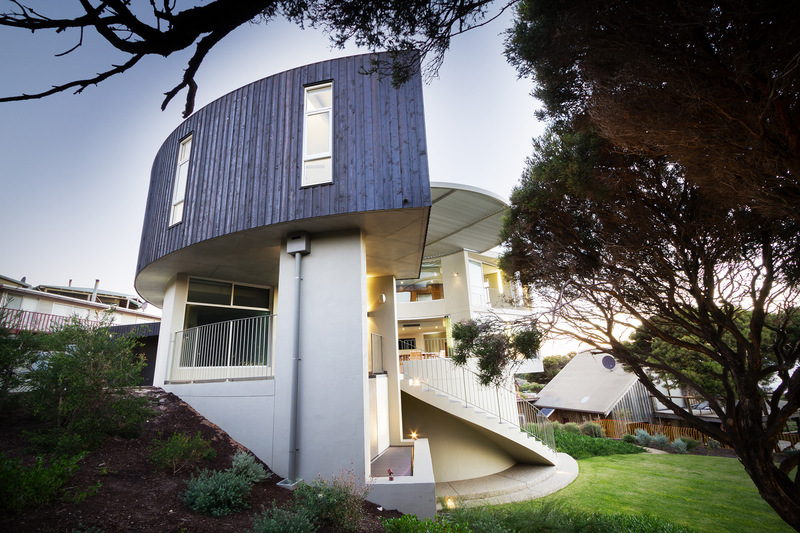 This spectacular home perched on the hill at Yallingup is completely circular and designed on plan to look like the trochus shell. This design coupled with the fact that the home sits into the side of the hill on a sloping block made it a challenging build to say the least. Coming out of the ground with all lines originating from one central radius point and all floors sitting over the same radius meant that precision was paramount to ensuring that all of the elements of this home came together in the way that they were intended. The industrial elements of polished concrete floors and off form concrete ceilings make this home extremely robust and all measures were made to ensure that this masterpiece is a landmark on the hill at Yallingup for a long time to come. A rough finish, Sante Fe style render and rough sawn vertically laid cedar boards were used to keep the ‘beachy’ feel to an otherwise very precise structure. The spectacular views are captured through the use of large curved glass panels in the meals area and the orientation of the home focuses all attention on the views up the beach to the north.